Over the past few years the trend of streaming content on demand over the internet has completely revolutionized the way most people watch their favorite TV shows, movies, and other online content. In fact, on demand entertainment streaming now accounts for more than 70% of peak internet traffic. Because of this trend, people now use their laptops, desktop computers, and smartphones to consume more video than ever before. However, it’s always nice to kick back in front of a TV and put on your new favorite binge-worthy show, and with streaming sticks becoming an increasingly affordable and accessible way to stream your content into the living room, there’s no reason not to upgrade your streaming experience. We took a look at the best Android TV Sticks available and picked out the five that give you the best bang for your buck. There are a seemingly endless number of Android based streaming sticks available for purchase. You’ve probably heard of the top brands, but don’t think that these are your only options. By running your digital media through an HDMI equipped TV stick you can have easy access to any content you want at home, and on the go. Because a Stick form factor takes up significantly less room than a full sized streaming box, it’s incredibly easy to take with you between rooms in your house. If you decide to take your binging session from the living room to your bedroom all you have to do is unplug your streaming device and take it with you. Plus, you can even take it on the road with you when you travel or even just to a friend’s house. We determined this final list by scouring the internet for reviews and doing extensive research on each of the streaming sticks we found. We tailored our list to the devices that will give you the best experience all around. We compared each of these meticulously, while considering which delivered the all-around best experience. We considered the status of each manufacturer and what each smaller manufacturer brought to the table. When you’re streaming your content from Netflix, Amazon Video, YouTube, or any of the many streaming services the most important factor is picture quality. Without support for High Definition, and Full High Definition (FHD) video output your brand-new TV may as well be from the 90’s. However, the smoothness of your video is just as important as the raw resolution so we made sure to look for the streaming devices with the hardware to back up their claims of high definition picture quality. After all, it’s hard to immerse yourself in a show or movie when the image keeps stuttering and the audio comes out of sync. These criteria allowed us to make a fully informed comparison of each device, and allowed us to decide on which best suits the needs of the user. When it comes time to finally sit down and watch the new season of your favorite show, the last thing you’ll want to do is wait. A UI that is unintuitive or a remote that is less than useful will do nothing but slow you down. A good streaming stick will have a simple, easy to use interface that puts your content front and center. You’ll also want a remote that’s heavy on functionality and reliable. The internal storage of a device that’s entirely geared towards streaming may seem like an unimportant detail, however, you’ll still need room to install your favorite apps and maybe even a game or two. Even though a plethora of internal storage isn’t necessary, we did take into consideration those streaming devices that went the extra mile and included the option for expandable internal storage. In order to stream hilarious YouTube videos and gripping dramas, you’ll need to be able to connect to the internet. A good streaming device will have a plethora of connectivity options and will reliably connect to your network. While additional functionality might not break down into specific numbers like some of our other categories, you may find yourself wanting a living room device that can do a little more than just stream. We took the time to narrow down our list to include those devices that went the extra mile to give you some added features you may not have been expecting. Our #1 pick for an Android-based streaming stick was the Amazon Fire Stick . Amazon has spent the last few years fine-tuning their fire brand, and this streaming stick is no exception. When it comes to speed, you won’t have to worry when using the fire TV stick as it packs a quad core processor and a gigabyte of ram with supported resolutions up to full HD 1080p. The Fire also supports some casual games that you may have already played on your smartphone, such as your favorite road crossing arcade game. The Fire comes with a simple to use remote that puts functionality first. It doesn’t have anything complicated like a full QWERTY keyboard, but it offers a simple approach to media that is designed to get you to your content fast. The on board 8GB of storage is a bit lacking, since it can’t be upgraded you may find yourself having to make some compromises down the road. As far as connectivity goes, your new Fire Stick will sport Dual-Band, Dual-Antenna 802.11ac for quick connectivity. Plus, support for 5.1 surround sound and Bluetooth 4.1. 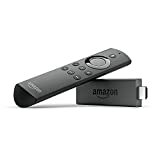 Additional functionality is really where the Fire Stick shines, as it comes equipped with Alexa, Amazon’s personal assistant. Using your Alexa voice remote you can find movies, play the next episode, launch apps, and even order a pizza. Even though the Amazon Fire Stick tops our list, the other four streaming sticks we tested are all fantastic options that each bring something different to the table. The Roku Streaming Stick 3600R came in as a very close second. Just like the Fire, the Roku packs a quad core processor and a gigabyte of RAM along with the same 8 gigabytes of non-upgradable, internal storage. The connectivity between the two is also identical as the Roku packs the same Dual-Band, Dual-Antenna 802.11ac connectivity. The Roku comes equipped with a similar, though less streamlined remote than the Fire. However, it does come with four buttons specifically tailored to take you to either Netflix, Amazon Video, Sling, or Google Play. While this can certainly be useful in getting you to your favorite content faster, if you don’t regularly use any of these four services then these buttons will do nothing but take up space. The Roku did receive extra points, however, for its free downloadable smartphone app that allows your phone to act as both a remote, and a wireless audio receiver allowing you to plug headphones in for private listening. Finally, where the Fire excelled in its incredibly versatile digital assistant Alexa, the Roku leaves a lot to be desired. While higher priced, and larger Rokus do have a voice search feature, this Stick we reviewed does not. Despite its slightly higher price tag, the Roku comes is a strong competitor for the Fire that has several great features, but that falls behind in the digital assistant field. Portable for different HDTVs in your home, hotel, and dorm rooms. While not necessarily a “stick”, the Google Chromecast 2 is a worthy competitor to the devices mentioned here while also maintaining a small form factor in an affordable package. The Chromecast does come in as the cheapest of the devices we reviewed and this does come at a price. One of the ways Google was able to keep the price so low was by not packaging a remote with the Chromecast, and instead relying on the fact that the majority of people already own smart devices that exist within the google ecosystem. Instead of using a remote to find content to stream, users of the Chromecast 2 must rely on their smartphone, tablet, or computer to stream content to the TV through the Chromecast. For people who already own a smart device and are looking to save some money with their Streaming Device purchase, the Chromecast is an affordable and sensible pick. While the Chromecast can mirror an Android Device’s screen to the TV, it doesn’t have much else in the way of added functionality, as Google is relying on your already owned smart devices to add any functionality you may want. Unlike the other devices mentioned in this top five list, the Chromecast does not allow you to install applications directly to it (you’ll have to install them to your phone). As far as connectivity goes, the Chromecast does outshine the Fire TV and Roku stick, as it allows for an Ethernet connections as well as the Dual band Wi-Fi connection and surround sound support. The Chromecast may have cut some corners to keep the price low, but it’s the perfect purchase for someone who already has a “smart” device lying around or in their pocket. The next device we tested is a bit of an outlier when compared to the other three options we’ve already mentioned. Where the other three devices came with a skin of Android specifically designed for streaming media, the Android Mini PC RK3288 is a streaming “stick” that runs full Android 4.4, allowing you to fully customize your experience for a bit more work and money. The specs on the mini PC are a Quad Core processor, 2 gigabytes of RAM, and support for resolutions up to 1080p. 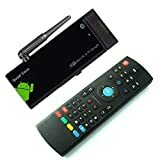 While this product may not be as easy to use out of the box, once paired with a controller or remote of your choice it transforms your TV into a massive Android device that you have full control over. You can install an emulator, or any apps that run on Android 4.4. This mini PC comes equipped with 8 gigabytes of internal storage, but you’re free to upgrade it using a micro-sd card. In terms of connectivity, the RK3288 provides you with a headphone jack for audio, a micro usb port for power, a usb 2.0 port for transferring data, and a HDMI port to connect to your TV. It also comes equipped with wireless functionality. As far as any additional functionality goes, this device allows you to do nearly everything you could do with your Android tablet, but on your TV. You won’t find any of the latest digital assistants here, but what you will find is a quality Android experience that you have full control over. Rounding out our list is the Easytone CX919 streaming device. It may be lacking a modern design, but it provides a unique experience out of the box. For starters, the Easytone comes with a Quad Core processor, 2 gigabytes of RAM, and 16 gigabytes of internal storage, which can be upgraded via a micro-sd card. It supports resolutions up to 1080p, and, just like the Android Mini PC, it comes equipped with Android 4.4. Unlike the previous mini PC a remote is included, and this remote adds plenty of functionality to an otherwise bland device. The remote sports the standard controls for a TV on the front side, but if you flip it over you’ll find a fully functional QWERTY keyboard that will make searching for videos easier than on any other device. The Easytone supports Bluetooth, HDMI, wireless connections, and USB cables for data transfer. While it won’t turn any heads, the Easytone CX919 provides a unique experience through its remote that is sure to transform your search for online content. This Android PC include wireless fly air mouse,easy to control. A good streaming stick will provide good picture quality, while being supported by strong hardware, and allowing for high quality connectivity and enough storage for all of your favorite service providers. And a few extra features never hurt anyone. Our top pick was Amazon’s newest Fire TV Streaming Stick for its quality hardware, ease of use, and high tech digital assistant that goes beyond just helping you find a new show. However, each of the devices we mentioned are top quality devices that will have no trouble delivering you on demand entertainment whenever you want it, with the portability and affordability that come with the Stick form factor. The trend of streaming content on demand has exploded in recent years. We take a look at the Best Android TV Sticks so you can join the movement!